A new one-click data integration is available for long-term care facilities that use SimpleMDS™ for MDS workflow automation and FoQIS™ for QIS/QAPI processes. The automated integration, available at no charge to existing customers, allows customers to seamlessly and securely share MDS 3.0 assessment data between the two systems. The integration automatically transmits MDS data to FoQIS from SimpleMDS with no user intervention, saving time and streamlining workflow for nursing and reimbursement staff. To ensure data quality, only assessments that have been accepted by CMS are utilized. Time savings. Data interchange is fully automated, eliminating the need for manual uploading of assessments to FoQIS. Staff can be freed up to focus on more strategic goals. Improved data accuracy. Automatic data updates eliminate errors or missing data due to manual processing. In addition, only valid assessments that have been accepted by CMS are utilized. Simple, one-click integration. Activating the data connection requires only a simple one-click activation within SimpleMDS. To activate the integration, the user administrator simply clicks “Enable” in the SimpleLTC admin view under “Application Connections” (detailed instructions available here). 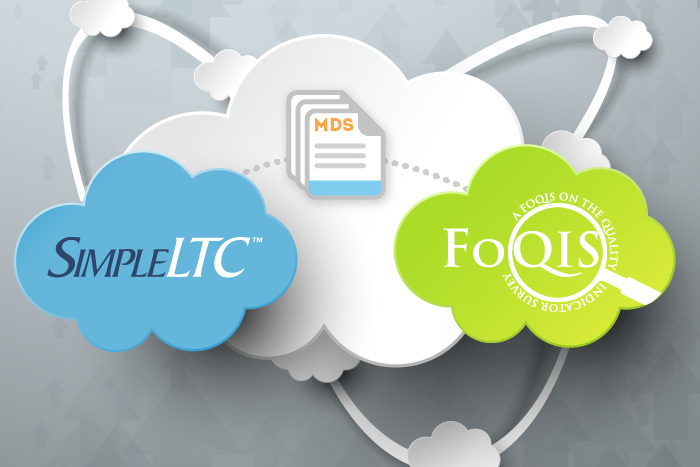 The SimpleMDS/FoQIS integration is free of charge to existing customers. To learn more about the integration, or how to enable it, please contact the SimpleLTC support team. FoQIS is the easy-to-use, web-based software that helps skilled nursing facilities improve survey results, manage the QIS process and implement QAPI. FoQIS simplifies the QIS and QAPI processes. It is the all-in-one solution to help your organization manage changes in the LTC regulatory environment. For more information, visit www.foqis.net. SimpleLTC software simplifies regulatory compliance, reimbursement optimization and quality measurement for long-term care facilities. More than 2,000 providers entrust their long-term care data to SimpleLTC and, as the largest third-party transmitter of MDS 3.0 assessments, SimpleLTC is recognized as a best-practice industry standard.